Well it had to happen. 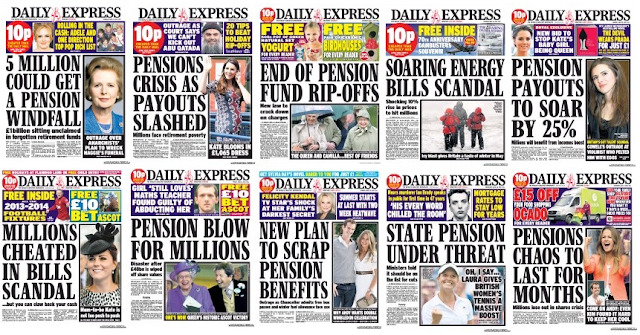 Groundhog Day dawned at the Express this morning, with publication of the front page on the right, which pretty well mirrors the one from April 23 on the left. A simple operation which could effectively cure high blood pressure is being tested on British patients. 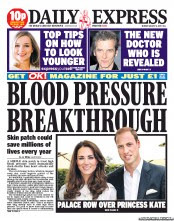 A simple skin patch to treat high blood pressure could dramatically slash deaths from heart attacks and strokes. This one has apparently been licensed in Japan, and could be available in the UK 'in the next couple of years'. In case that is too long, or you don't fancy wearing a patch or a bit of keyhole surgery in your lunch hour, the paper has had some other ideas about what you should or should not do. People have been saying for years that the Express is selling to a dying readership - but the paper is doing its damndest to keep them alive. It seems to have a clear vision of its typical readers: a retired (or soon-to-be-retired) couple hankering for the Britain of the 50s. They have more than a few aches and pains between them and worry about how they are going to finance their old age. Their home is their biggest asset, so they constantly check estate agents' windows and every market report to see if prices have recovered from the 2008 crash. They have a pension and find life on a fixed income tricky in this era of low interest rates. 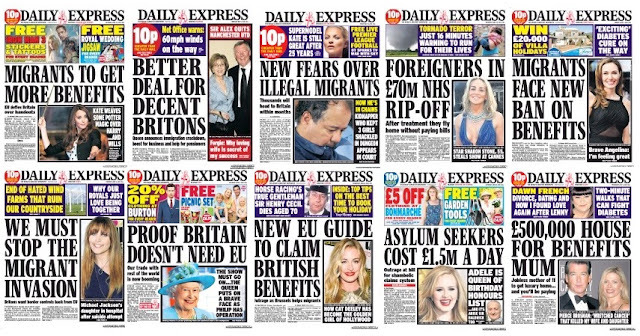 The Express couple are convinced that Europe and immigration are to blame for every ill in the country and they give thanks daily for our wonderful Queen and the delightful Wills and Kate. Harry's a bit of a handful, but he's learning. They are even coming to see Camilla as a good egg - though of course she can never replaced the sainted Diana. If they have a conversation with the neighbours, there is only one topic: the weather. They are unlikely to talk about the news because only the biggest events penetrate their cocoon. Do such people exist? Perhaps there are a few 20th century outposts dotted around the country, but surely not enough to keep a newspaper afloat? And those middle-class, middle Britain, Little Englander hypochondriacs that do survive are not - as the Express appears to suppose - middle-aged, but well into their seventies and eighties. People in their fifties and sixties are still hard at work, and when they have time off they climb mountains, sail, fish, play golf, watch football, go to festivals, theatres, cinemas, concerts - or simply down the pub. They are internet savvy, fashion conscious and run almost every village or small community in the country. They have no intention of reaching for their slippers and pipe. Whatever the readership, the duplication at the top of this post is unforgivable. Readers and casual observers may get a feeling of deja vu every time they pick up the paper - is this today's, yesterday's or last week's? 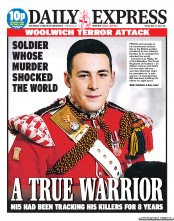 But what were the editor, night editor, chief sub, picture editor thinking? Don't they remember their own work? 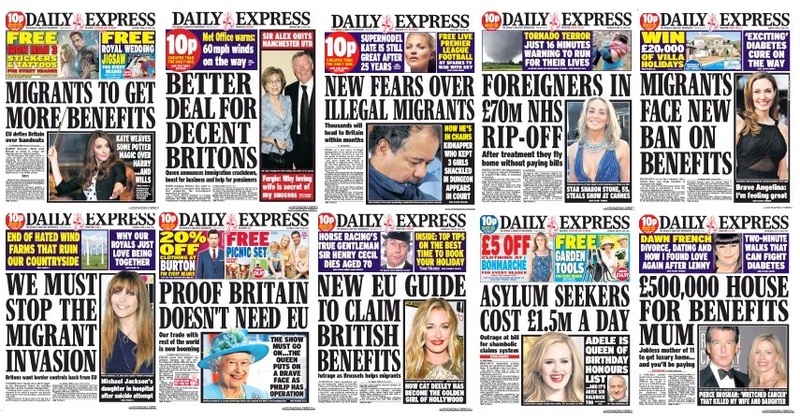 In a spirit of helpfulness, SubScribe has gone back over the Express front pages since April 1 - for some reason it seemed an appropriate date - and sifted them by subject matter. Over the past four months, hard news has intruded on a handful of occasions: the Philpott case, the Boston bombing, the death of Thatcher, the murder of Lee Rigby, the arrest of Rolf Harris, the birth of Prince George, and the proposal that patients should have to pay to see their GPs. There have also been the developments (if you can call them that) in the Madeleine McCann case. Keep slim, stay active, drink alcohol in moderation, don't smoke, choose oily fish over red meat, eat five portions of fruit or veg every day, avoid sugary and high-fat foods and drinks - and breastfeed your baby until he/she is six months old. So much for revolutionary thinking. But worry not, there are plenty of wonder drugs, magic pills and miracle cures - and advice on how to avoid nasty things we don't want. 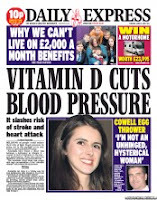 I'm particularly keen on the proof that statins save your life on April 4 being followed up on July 7 with statins really do save your life - as though anyone could disbelieve the Express. And everything is so simple - a simple jab here, a simple operation there, a simple test for this, a simple change in lifestyle to that and we'll all be feeling simply wonderful. It's all very well to joke, but this approach to health matters is worrying - and remember these are just the front pages; there are many more such stories inside. Thousands of researchers (aka scientists or even boffins) are conducting experiments in laboratories all over the world. They learn a little bit at a time about what causes a condition and this gives them a clue as to how to try to combat or prevent it. Many months or years of work are then needed to devise a drug - and there's no guarantee that it will work. Saturday's splash Alzheimer's cure is close is a case in point. The story explains that clinical trials on two new drugs had to be halted three years ago because of serious side-effects, including internal bleeding and skin cancer. A Swiss research team now believes it has found a way to overcome such problems. But that doesn't make a cure 'close'. The drug has to be developed and undergo many tests before it gets anywhere near a human being. But the Express doesn't deal in maybes - everything has to be a risk or a cure. Genuine breakthroughs that will revolutionise treatments are rare, yet to look at the Express you'd think they were happening every day. Of course every step brings you closer to your target - just as reaching Exmoor after heading out from Land's End indicates progress, but it doesn't mean you are anywhere near John O'Groats. So much for health issues. Next on the list of favourites is the weather, and our stick-in-the-mud readers obviously won't want any of this celsius nonsense. Good old-fashioned fahrenheit is what they need so they can sizzle at 100 rather than a lame old 33. Then, of course, they should be shivering 32 instead of 0, which also seems odd. Still, there's nothing to beat flexibility: the -12 we experienced over the coldest Easter for however many years was (thankfully) C not F.
The predictions were all over the place in the spring. At the beginning of April people were moaning about drought warnings, which seemed reasonable after all the rain and flooding that had gone before. The downpours in the middle of the month seemed to prove the point, but by the 30th we were again looking forward to drought. We had a lovely warm Mayday bank holiday, but soon we were being warned to expect yet more rain. And yes it came. 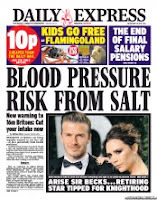 In the middle of June we were promised a tropical heatwave, and then when summer really arrived last month, the Express wasn't sure whether this was something dangerous or something to savour. The one thing that was certain was that it had to be the splash. 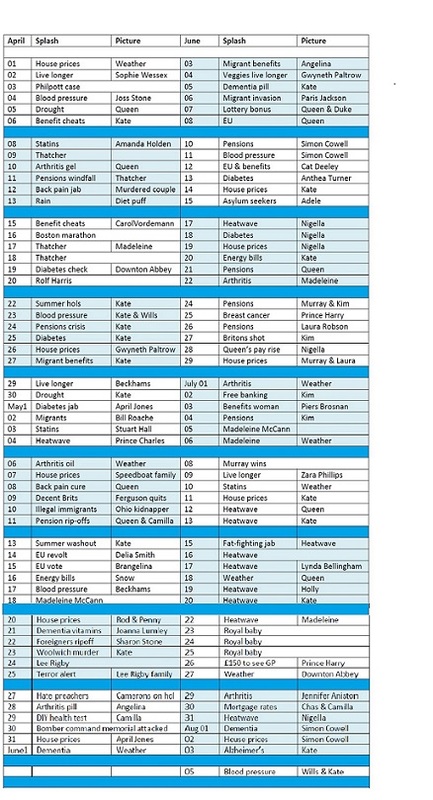 The paper led on the weather every day from July 12 until the 23rd, when the royal baby intervened. Little George was given three days, the GPs with their £150 charge popped up on the 26th and then it was back to the usual diet of weather, health scares and house prices. But hang on, what about pensions and foreigners and benefits? 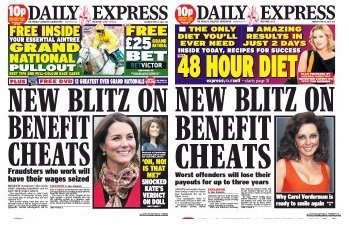 Yes, these are the other staples of the Express diet, but they were all given a rest for most of July. 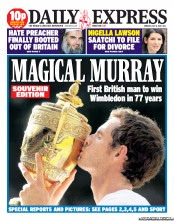 Apart from the weather, there were a couple of days of Madeleine McCann and Andy Murray won at Wimbledon. But there had been plenty of money matters earlier. Oops, there's another case of deja vu...with the same heading in the same shape on April 6 and 15. And not only that, they've contorted the type. This is a crime. We have the same wording on both pages, but we need more room to get both Kate and the doll in the picture slot - so the bottom two lines have been squeezed. And, while I wouldn't swear to it, it looks suspiciously as though those two lines have been stretched on the second page. Never mind. Our ageing couple don't need benefits; they've been brought up to stand on their own two feet, but they are concerned about whether their savings will cover their outgoings. 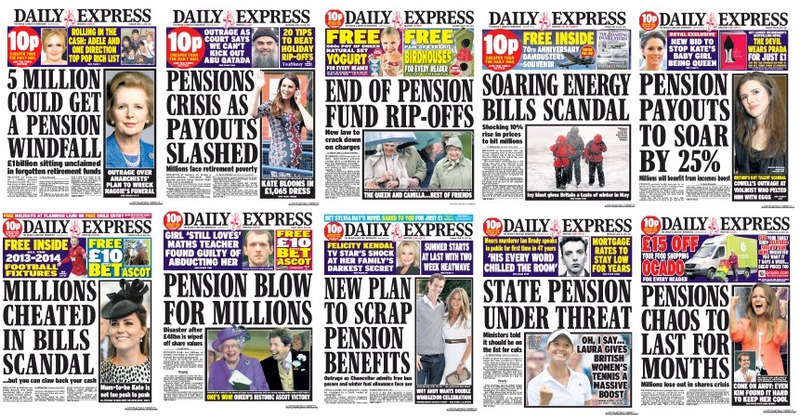 On pensions, the Express doesn't know whether it's coming or going. There's a windfall in the air on April 11, then a crisis less than two weeks later with payouts slashed. But worry not, by June 10 they're soaring. Oops. 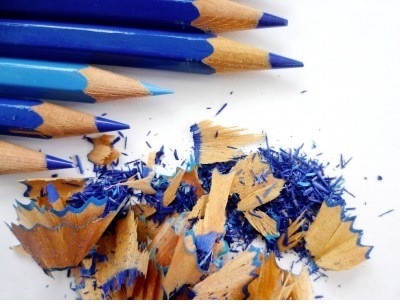 Spoke too soon, there's a blow for millions the next week, followed swiftly by assaults on the state pension and by July 4, the paper is resigned to the 'chaos' lasting for months. Still, at least the weather picked up around then. And so we come to house prices. 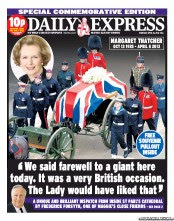 The Express is quite restrained on this front if you think about it. Every month there are four big surveys of house prices - from the Nationwide, the Halifax, the Royal Institute of Chartered Surveyors and the Land Registry. They all put a number on that mythical 'average house' - but it's never the same. The building societies and banks produce their figures on the basis of loans approved, RICS focuses on estate agents' asking prices and the Land Registry on the prices achieved in sales that have completed. All of these figures and portraits of a market in recovery are distorted by London, where vast properties costing many millions are sold to foreign billionaires - largely from Qatar and Russia. If you tried to come up with an average house sale price on the basis of a few hundred semis across the country and a dozen West London mansions, you are unlikely to reach a sensible number. 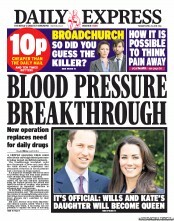 The Express adds in its own complications. It not only runs statistics compiled monthly by accepted industry sources, but it also conducts ad hoc straw polls of its own. Last Friday's splash, House prices to rise £33,000, is an interesting example. Simon Ward, chief economist at Henderson Global Investments, told the paper that he thought property was undervalued by about 13 per cent, based on rental yield. In other words, someone looking to invest in a house to rent out could afford to pay a fair bit more than current sale prices and still get a reasonable return. That is not the same thing at all as buying a house to live in. On the basis of one analyst's view of the rental market, the Express has gone away and added 13 per cent to the £162,000 being paid for the 'average three-bed semi', based on Land Registry figures of completed sales. That put an extra £21,000 on the value of the house. But couldn't that be made more dramatic? What happens if you try the same sum using 'average asking prices' - which will, of course, include our London mansions and the pipedreams of sellers with unrealistic expectations of what their home is worth. This way we have an average price of around £253,000 and the promise of an increase of £33,000. Remember, nobody anywhere along the line has actually said they would go up by that amount. Just that landlords looking to enter the buoyant rental market could stand that sort of increase and still make money. 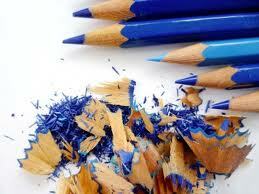 3: even when you've agreed a deal there are a dozen things that can go wrong. These are compounded by the shortage of houses for sale and the unaffordability of property for young people who need to have enormous deposits even to contemplate putting a toe on the ladder. Then there was Kate. 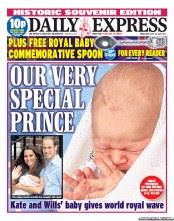 Everyone made a fuss of little George when he was born, but the Express could hardly contain itself throughout the pregnancy. Aside from the three days around the birth, the Duchess of Cambridge was the subject of the paper's main front-page picture 17 times between April 1 and August 5 - including six times in eight days at the end of April. She also made a few guest appearances in the puff. The Queen appeared ten times as the main image, plus a few puffs, Camilla three times, Charles and Harry twice, while Sophie, Zara and the Duke of Edinburgh were on the front once each. 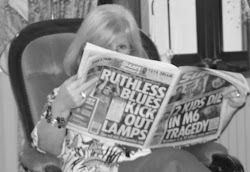 Madeleine McCann was the lead to the paper three times, the front-page picture five times and in the puff twice - with the same image used every time. Other picture choices included Nigella Lawson (5), Andy Murray's girlfriend Kim Sears (3), Angelina Jolie (3), and Laura Robson, the Beckhams, Gwyneth Paltrow, Joss Stone and April Jones, who each appeared twice. It's easy to mock. If you have a winning formula, by all means stick to it. The Express has struck on a losing formula and won't let go. It is losing readers to the graveyards, to the internet, to rivals. Circulation has fallen by half to just over 500,000 since the beginning of the century (Although as an esteemed former colleague has pointed out, that is still more than the Guardian and Independent combined). The Crusader logo remains on the titlepiece, but the paper no longer shows any crusading spirit. It cheats its readers every day with that red roundel that suggests they can buy it for 10p, when what it is really pointing to is how much cheaper - in cash terms - it is than the slicker Mail. 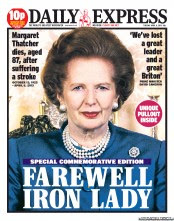 It is all a great shame for a once-great newspaper. 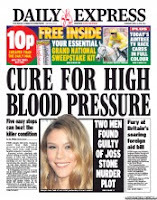 And even more so, because when it dares to put the Health and Beauty Express template aside, it is still capable of coming up with front pages to challenge the best. 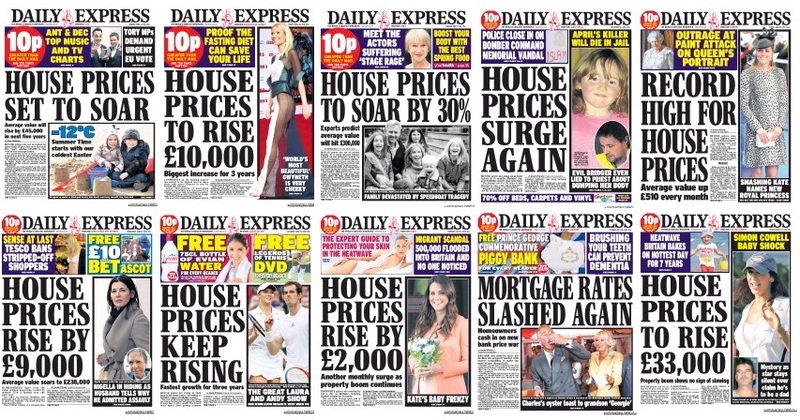 The Express is far from the only paper to stick to a formula. SubScribe will be looking at some of the others next time.